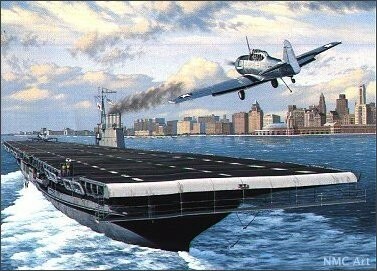 August 22, 1942 – At 3:00 p.m. the United States Navy formally commissions the aircraft carrier Wolverine off Madison Street. The ship is the country’s only paddlewheel aircraft carrier and will be used to train pilots operating out of the Naval air station in Glenview as they practice carrier landings and take-offs. Captain E. A. Lofquist, Chief of Staff of the Ninth Naval District, makes the dedication address, after which the Navy’s commission pennant, displaying one red stripe, one white stripe, and seven stars set in a field of blue, is raised from the Wolverine’s masthead. Two fighter planes, one of which is piloted by Commander Edward J. O’Neill, a pilot who flew in the Battle of Midway and the officer in charge of operational training once the ship is commissioned, circle overhead during the ceremony. The city fireboat Fred Busse and two tugs carry several hundred young men who have signed up to take the naval aviation course. For more on the Wolverine and her sister carrier, the Sable, you may turn to entires in Connecting the Windy City here and here. 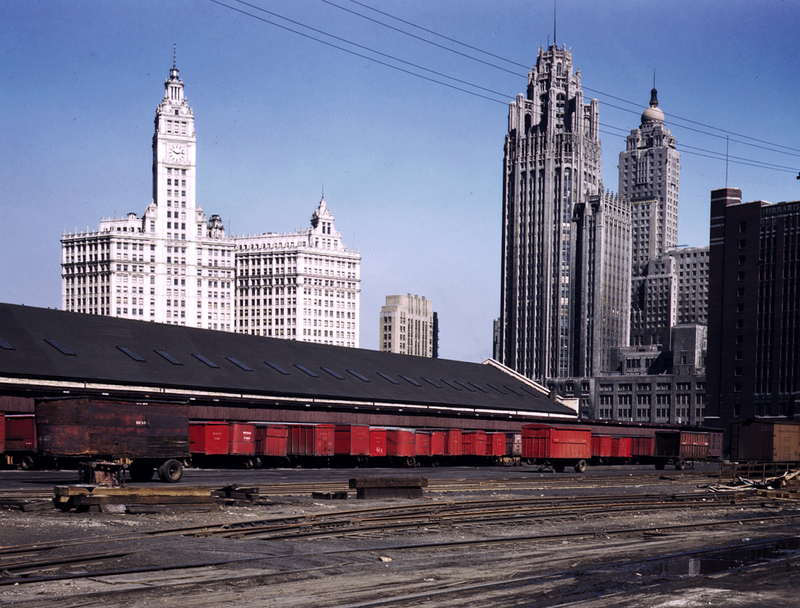 Information about Navy Pier and its service during World War II can be found here. August 22, 1969 – The City Council Buildings and Zoning Committee unanimously approves the guidelines for the development of the Illinois Central land and air rights south of the Chicago River and east of Michigan Avenue, asking for a change so that advertising signs will be banned in the area. Louis, Hill, the Commissioner of Development and Planning, says that developers will provide streets, utilities, a fire station, a dock wall along the river, a six-acre park, a school, and a subway and station to serve the area. The approval follows four days after the Chicago Plan Commission approves the same plan. The area approved for the new development is shown in the photo above.